The San Diego City Council on Tuesday backed City Attorney Mara Elliott’s appeals over the legality of two initiatives to redevelop the Mission Valley stadium site. 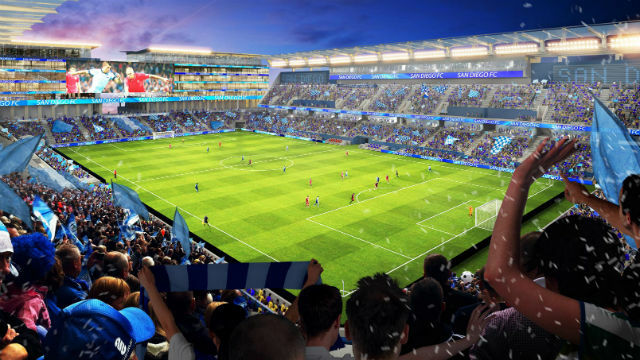 Both SoccerCity and SDSU West proposals were ruled qualified for the November ballot in two separate cases by different judges. The City Council voted 5-3 to allow Elliott to go forward with separate appeals for each initiative. Elliott based her appeals on last week’s ruling by the California Supreme Court that pulled the 3 Californias initiative off the ballot because there were questions about its validity. The ruling said a pre-election review may appropriate when there are questions about an initiative’s legality. “Pre-election review of these local initiatives will ensure that an invalid measure is not presented to voters, avoiding years of costly litigation and delay,” Elliott said. Both proposals earned enough signatures to qualify for the November ballot. Whichever measure receives the most votes — assuming it exceeds 50 percent — will win the rights to negotiate with the city to redevelop the current SDCCU Stadium site in Mission Valley. The SDSU West plan proposes the sale of about 132 acres of city property to San Diego State University or an auxiliary organization to clear the way for a new 35,000-seat Aztecs football stadium. The facility would also accommodate professional soccer, concerts as well as other events, and could expand to accommodate a future NFL franchise. The SoccerCity initiative, meanwhile, proposes a 99-year property lease and construction of a 23,500-seat soccer stadium that could be enlarged for football games.